Chronology, Types, Characteristics of Late Stone Age Arts and Crafts.  What is Neolithic Art? For the earliest 100 artworks, see: Oldest Stone Age Art. In Prehistoric art, the term "Neolithic art" describes all arts and crafts created by societies who had abandoned the semi-nomadic lifestyle of hunting and gathering food in favour of farming and animal husbandry. Not surprisingly therefore, ancient pottery including terracotta sculpture was the major artform of the Neolithic, although human creativity of the age expressed itself in a good many different types of art, including prehistoric engravings and hand stencils, as well as a variety of mobiliary art (sculpted statuettes, personal adornments). In addition, the construction of religious temples, shrines and tombs to serve the new sedentary culture led to the development of megalithic art and a form of monumental stone architecture using megaliths (petroforms). The Neolithic period - which heralded the beginning of civilization - witnessed a massive change in lifestyle across the world. From the time that the Ice Age finished (about 10,000 BCE), the old Paleolithic hunter-gatherer existence started to disappear, as the herds of reindeer and other animals went north. Cave art disappeared as people began to adopt a more settled existence, based on agriculture, the rearing of domesticated animals and the use of polished rather than chipped stone tools. However, there is no single date that marks the beginning of the Neolithic, since agriculture became established at different times in different parts of the world. NOTE: The above dates are very approximate only, as disagreement among scholars persists about when exactly the Neolithic started and finished in differing geographical regions. For more dates, please see: Prehistoric Art Timeline (from 2.5 million BCE). As in all eras of Stone Age art, what happened in everyday life had a major impact on the art of the period. Paleolithic man had focused all his energies on hunting for food and procreation - as illustrated by the Lascaux cave paintings and the fertility symbols known as Venus figurines, respectively. In contrast, Neolithic man found that cultivating crops made life much more secure. Indeed, as Neolithic farming settlements gained control of their food supply and became less vulnerable to predators, several things happened. First, the population expanded significantly: from 8 million to 65 million within 5,000 years. Second, communities became more aware and more protective of their "territory". They frequently merged with others, creating larger settlements and (ultimately) cities. Thirdly, they became more organized and more hierarchical. Lastly, Neolithic man began to develop systems of belief in supernatural deities. Each of these social developments had an impact on the art of the period. Pottery is still considered to be the diagnostic artifact of the Neolithic, notwithstanding that Japanese Jomon pottery and some Chinese pottery predates the Neolithic by several millennia(!). For the world's earliest ceramic pots, see: Xianrendong Cave Pottery (c.18,000 BCE), the slightly later Yuchanyan Cave pottery (16,300 BCE) and the Amur River Basin Pottery (14,300 BCE) across the Siberian border in Russia's Far East. For early ceramics in Europe, see: Vela Spila Pottery (15,500 BCE) from Korcula Island, Croatia. Ceramic art in the Near East is usually separated into four periods: the Hassuna period (7,000-6,500 BCE), the Halaf period (6,500-5,500 BC), the Ubaid period (5,500-4,000 BC), and the Uruk period (4,000-3,100 BC). During the Hassuna period, low-fired pots were made from slabs, undecorated and unglazed. But by the Halaf era, wares were decorated with intricate painted designs, as well as incised patternwork and burnished. With the invention of the potter's wheel in Mesopotamia during the Ubaid period, pottery manufacture was revolutionized, enabling increasingly specialized craftsmen and mould-makers to supply the growing demand for new shapes and new types of vessels. See also: Pottery Timeline (from 26,000 BCE). In Neolithic India, pottery was in use during the Mehrgarh Period II (5,500-4,800 BCE) and Merhgarh Period III (4,800-3,500 BCE), as well as during the later Indus Valley civilization (3300-1300 BCE). 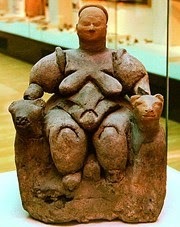 In Europe, clay-fired ceramics originated during the era of Paleolithic art - see, for instance, the Czech statuette known as the Venus of Dolni Vestonice (c.26,000 BCE) - and thereafter developed in fits and starts. In Africa, the earliest pottery dating back to at least 9,500 BCE was unearthed by Swiss archeologists in Central Mali. Ceramic pots ornamented with human, bird, plant or animal motifs. Ceramic ware decorated with figurative or abstract patterns. Tortoise shell carvings, and the 33 Jiahu flutes carved from the wing bones of cranes, which are among the world's oldest musical instruments. 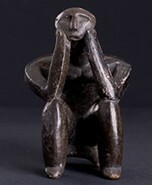 Terracotta figurine from Vinca-Belo Brdo. Now in National Museum of Serbia. Extraordinary iconic figurative sculpture made during the Neolithic Hamangia culture. Now in the National Museum, Bucharest, Romania. Sandstone sculpture of a man-god figure, found in the Danubian Settlement of Lepenski Vir, Serbia. 12-inch Limestone statuette from the Uruk culture of ancient Iraq. Now in the Louvre Museum, Paris. For other later Mesopotamian cultures, please see: Assyrian art (1500-612 BCE) and Hittite art (1600-1180 BCE). One of the greatest examples of Sumerian art from ancient Iraq. As Neolithic settlements grew in size so did the need for rules and social norms. This led to, or coincided with, the development of religious belief systems and the worship of deities. This in turn led to the gradual emergence of monumental religious architecture for shrines and tombs, which evolved alongside the religious beliefs that it celebrated. The most famous examples of such works are the Egyptian Pyramids (c.2650-1800 BCE). For more detailed information, please see: Ancient Egyptian Architecture (3,000 BCE to 200 CE) and Early Egyptian Architecture (3100-2181 BCE). The most important post-Paleolithic structure of the Stone Age. Begun during the Mesolithic era, completed in the Neolithic. Sister site to Gobekli Tepe. Large Neolithic and Chalcolithic proto-city in southern Turkey. One of the most important archeological sites of the Neolithic period in Southern Asia. See also: Indian Sculpture (3300 BCE - 1850). Believed to be a fertility cult centre. Decorated with spirals, mazes, anthropomorphic "shield" motifs. Extensive necropolis noted for its engraved pictographs, including spiral and rhombus-shaped motifs, as well as concentric circles, herring bone patterns, zig-zags and axes. Featuring decorative dots symbolizing cattle, carts and ploughs. Estimated to contain one quarter of all the megalithic art produced in Europe. The world's most famous assemblage of large upright stones (menhirs). In Africa, Oceania and Australia, the Neolithic era is characterized by outdoor rock art, including petroglyphs and a diminishing amount of cave painting, notably hand stencils and other pictographs and petrograms. Here is a short list of the most famous examples of rock art created during the Neolithic period. One of the world's largest collections of petroglyphs dating from Paleolithic, Mesolithic and Neolithic periods. Pilbara, Western Australia. Aboriginal paintings created throughout the Stone Age up to the modern era. Arnhem Land, Northern Territory. Different styles of human-figure paintings (Tassel, Sash, Elegant Action Figures and later Clothes Peg Figures) in the Kimberley area of Australia, created throughout the Late Stone Age. Rock engravings on quartzite stone, found by the Lottering River, Western Cape Province, South Africa. Famous for its collages of several hundred hand stencils, in the Western Cape, South Africa. This UNESCO World Heritage Site, with an estimated population of around 10,000 and composed entirely of mud-brick buildings, is the most extensive and best-preserved Neolithic site found to date. Excavations showed that all rooms had been kept meticulously clean, while the dead were buried in pits beneath the floors and hearths. Colourful murals were painted on interior and exterior walls throughout the settlement. Some one hundred clay figurines of women - such as "The Enthroned Goddess of Catal Huyuk" (c.7,000 BCE), a Mother Goddess figure about to give birth while seated on a throne - were sculpted in marble, blue and brown limestone, alabaster, calcite, basalt and terracotta. Another 1900 figurines were sculptures of animals. Although no temples have been identified, heavily decorated chambers may have been shrines or public places of worship. Mural paintings featured hunting scenes, aurochs and stags, as well as images of men with erect phalluses. A painting of the village, against a scenic background featuring the twin mountain peaks of Hasan Dag is reputed to be the world's first example of landscape painting. The inhabitants of Catal Huyuk cultivated crops and domesticated sheep and cattle, although hunting continued to be a major food-gathering activity. Situated on the Kacchi Plain of Balochistan, Pakistan, this 495-acre site is one of the oldest known centres of Neolithic farming and animal husbandry in South Asia, from which some 32,000 artifacts have been excavated to date. It is also a significant producer of Neolithic pottery. Scientists have classified the occupation of the site into several different periods, as follows. Mehrgarh Period I (7000-5500 BCE) was Neolithic and aceramic (devoid of pottery). Ornaments made from limestone, lapis lazuli, sandstone, turquoise and sea shells have been discovered, along with statuettes of women and animals. The discovery of these statuettes is highly significant: it means that Mehrgarh was responsible for the oldest known ceramic cult figurines in South Asia, made even before the site's first pottery. It was only in Mehrgarh Period II (5500-4800 BCE) and Mehrgarh Period III (4800-3500 BCE) that craftsmen began making pottery. During Period II the potter's wheel was introduced. Mehrgarh craftsmen also made glazed faience beads and terracotta figurines decorated with paint and ornaments, as well as button seals in bone and terracotta and bone, embellished with geometric designs. Further cultural and artistic developments occurred during Period IV (3500-3250 BCE), Period V (3250-3000 BCE) and period VI (c.3000-2600 BCE). By 2,000 BCE, the quality of Mehrgarh's pottery appears to have suffered due to mass production, and also because of a growing interest in bronze and copper.  For early tomb art, see: Early Egyptian Architecture of the Old Kingdom.  For early Chinese culture, see: Xia Dynasty Culture (c.2100-1600 BCE).  For Iron Age crafts, see: Celtic Hallstatt Culture (c.800-450 BCE).  For more information about Late Stone Age arts and crafts, see: Homepage.